I'M ALIVE! Oh, Internet, how I've missed you. If you follow me on Instagram, you might have seen bits and pieces of my PC struggles posted in my "Instagram stories." What happened was a Microsoft (Windows 10) update murdered my PC and had me stuck at the start up screen (with those evil white spinning dots that I still see in my nightmares) and it took me AGES to sort out all the damage. Thankfully I'm back in business, with all my files to boot, and I can finally get this blog back on track! We all know I'm a huge fan of Aldi, but I like their sister store, Trader Joe's too. (That's right, they're owned by the same people! Take that snooty-Aldi-hating hipsters!) 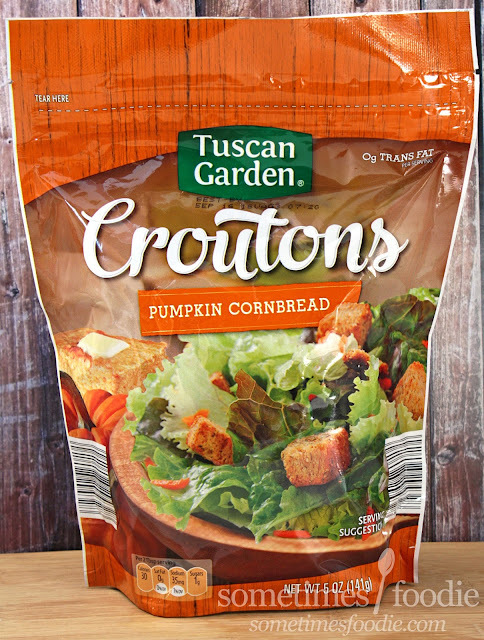 One of the items that I really liked from Trader Joe's pumpkin-pocalypse offerings was THIS pumpkin themed bagged salad. It had field greens, dried fruit, pumpkin vinaigrette, pumpkin seeds and pumpkin croutons. When I spotted this bag of seasonal croutons at Aldi (last year *cough**cough*) I was excited because I thought I could use these to create my own fall themed pumpkin salads...but obviously I wasn't that excited...Because I completely forgot I bought these. I may have missed out on all my Instagram-worthy fall salad moments, but I can still enjoy these in my own winter-basic kind of way. 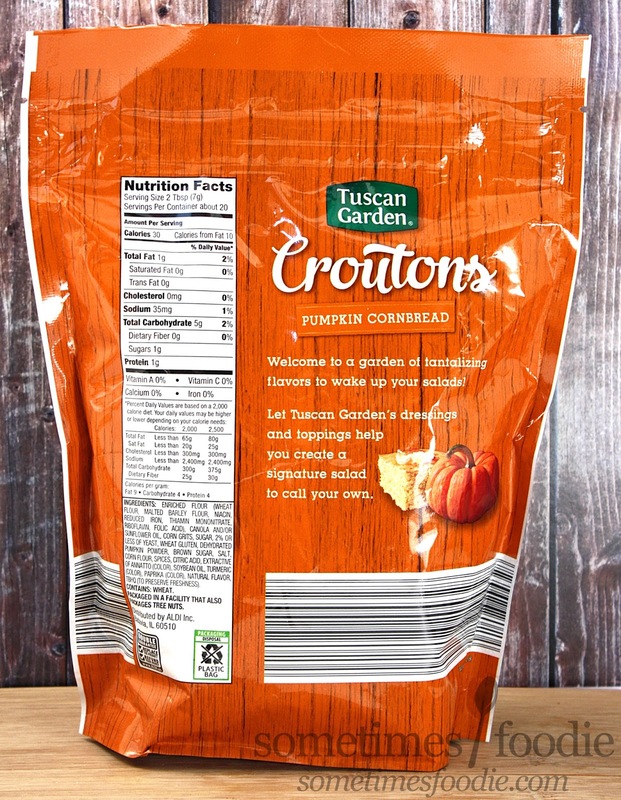 The bag for these croutons is resealable (yay) and it's design is reminiscent of the other croutons varieties you can buy at Aldi year round. Aesthetic-wise, this is a big step up from how the bags looked when I first started shopping at Aldi years ago, but the typeface choices lack a certain sophisticated-ness that name-brand bad designs have. It's getting close to being name-brand-passing, but it's not there yet. 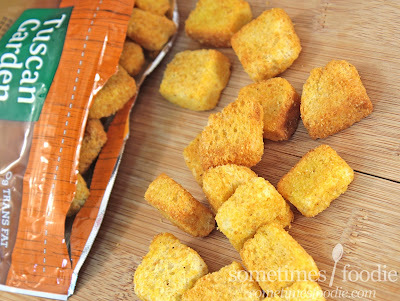 Inside, the croutons are a warm corn-bread-y yellow color and they have a slightly sweet aroma. It's not sweet as in sugary breakfast cereals, it's a more natural kind of sweet, like corn. (Which makes sense, this is a cornbread-based crouton after all.) It's been a while since I've had the ones from Trader Joe's, so I can't say with complete confidence that this tastes exactly like it (although odds are it is a re-branded re-packaging of the same item) but it's exactly what I remember. The crouton is light, crispy, sweet, very corn-bread-y, and there is even an earthy hint of squash. If I hadn't of seen the package I don't think I'd be able to guess that these were pumpkin specifically, but the flavoring is definitely fall inspired. Also, FYI, they taste perfectly fresh! You'd never guess these were sitting in my pantry...for a whole year. 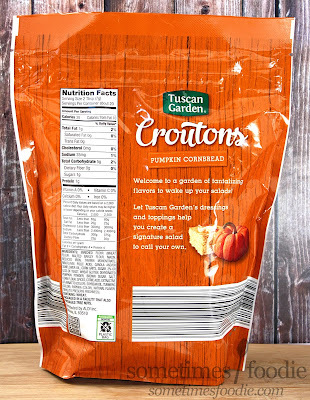 With these croutons you get exactly what the package promised, cornbread with some light pumpkin/squash flavoring. I've used these with chopped romaine, diced pear, dried cherries, walnuts and balsamic, and I've eaten them in Asian inspired salads with the carrot-ginger dressing. They didn't return to Aldi this year, but I'm hoping it makes a comeback next year. They'd be perfect for Thanksgiving! Now, I'm going to go listen to ELO and the Xanadu soundtrack while I type up some LONG OVERDUE reviews for you guys.